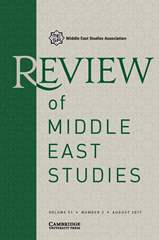 The Review of Middle East Studies (RoMES) is the Middle East Studies Association’s online journal of review, available through Cambridge Journals Online. Published twice a year, RoMES looks to bridge divides between fields, publics and geographies in Middle East studies. The addition of special focus discussions and sections on pedagogy and curation are part of an effort to specifically bridge academia and “the public”; research and pedagogy; scholar and practitioner; resource acquisition specialists and users; artists and critics. Typically, there are 20-30 reviews reflecting a range of recently published books in the field of Middle East studies. Those interested in writing book reviews for RoMES should submit a CV and a list of areas of expertise to the editorial office (romes@cmc.edu). MESA members have access to RoMES as a benefit of their membership. Advertising is available in RoMES. Information about display ads is available here. Information about banner advertisements on its Cambridge University Press site, is available here.